The family Limburg-Stirum is a branch of the Counts of Berg, with as oldest ancestor Adolf I Count of Berg, mentioned 1079-1105, with as seats Hohenlimburg and Styrum. Through the marriage in 1539 of Georg Count of Limburg and Ermgard of Wisch, Countess of Bronckhorst and Lady of Wisch and Borculo, the family acquired important possessions in the Netherlands. 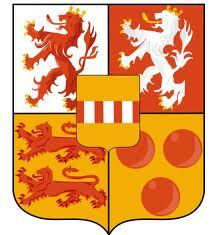 The present family of the Counts of Limburg Stirum descend from the morganatic union of Otto Ernst Gelder Count of Limburg and Bronckhorst, Lord of Borculo (1685-1769) and Anna Lucia van Klinkenberg. All other lines have become extinct. 67. Alwine Amalie Dietze * 1818 + 1865; Dr van Königlich Sächsischen Kammerkommissionsrates Johann Gottfried D.